So, why exactly does this matter for your company? What does the hybrid cloud bring to the table in terms of benefits? There are many technical answers but there is a simple right out in the open. You only have to look at the top companies and their utilization of the hybrid cloud to find that answer. 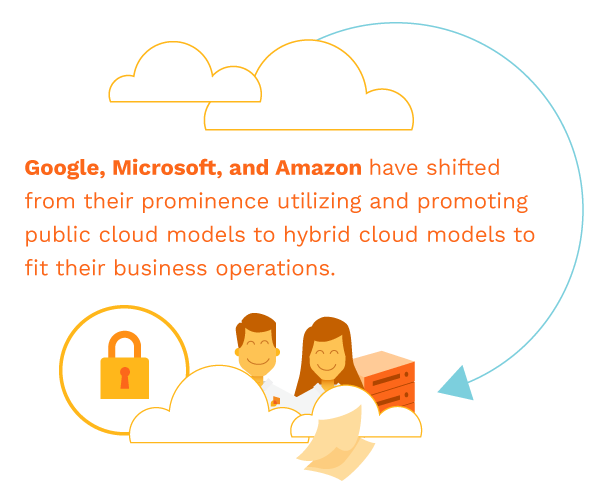 Top companies like Amazon and Google utilize the hybrid cloud to combat scalability issues. At its core, the hybrid cloud is almost infinitely scalable because of the way it operates. It allows your company to maintain its own private cloud for sensitive data and information while also allowing you to use the public cloud for business operations. So instead of having to spend additional money and effort into building and supplying hardware for internal servers, your company can use public clouds to help alleviate that stress. At whatever size your company is at, it can handle the natural evolution of business easier with assistance from the hybrid cloud. As mentioned previously, security is a top issue for many companies. A hybrid cloud allows a balance between scalability without having to compromise security. Hybrid clouds allow for robust flexibility while also offering the benefits of the security of on-premises private clouds. There is no compromise as data can be interchangeable and sorted according to priority and sensitivity which would eliminate a majority of the risks that are associated with public services. These companies, along with many others, are creating platforms that allow for the hybrid cloud model to flourish within their companies and for their customers. Working with customers and with the public cloud while also maintaining the privacy and security of private cloud allows for ease of use and improves the quality of life for customers and for companies alike. Platforms like Kubernetes and Azure Stack are pushing the hybrid cloud further into the spotlight and soon many companies will adapt and innovate this model as the next IT paradigm. As a company, the drive to push towards sustainable operational models while also maximizing efficiency and productivity is a goal that is wanted by many. The hybrid cloud helps to achieve this goal by allowing the benefits of both the public and private cloud to complement each other’s strengths and eliminate each other’s shortcomings. Your company should make the necessary steps to research and invest in the hybrid cloud. Bring benefits without compromises and maximize your company’s potential by knowing what the hybrid cloud can do for you like it does for many other companies.